I hate throwing fabric away. I also hate having it accumulate in my closet. 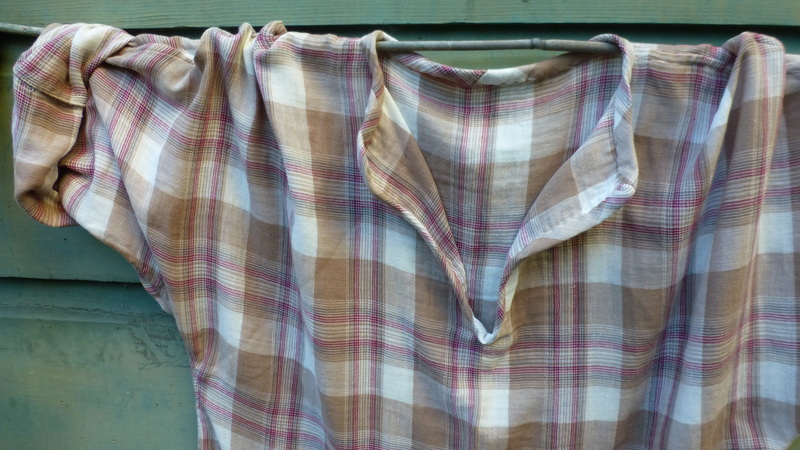 This was a solution to take care of some wonderful large scraps of fabric left over from another project. 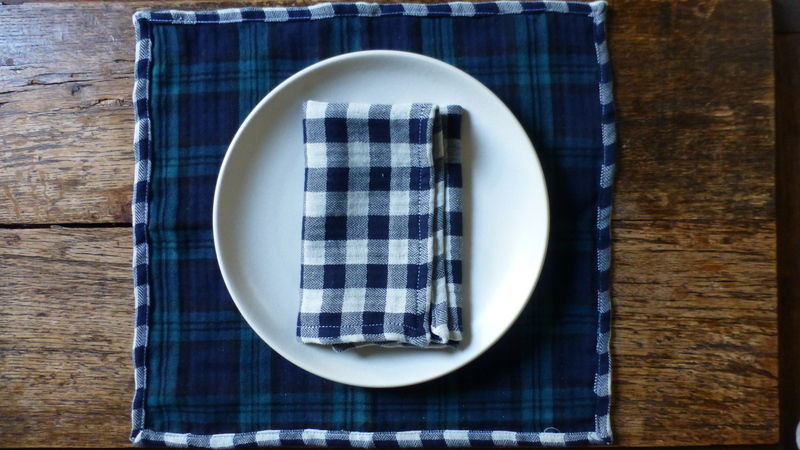 Turn them into delightful little napkins! 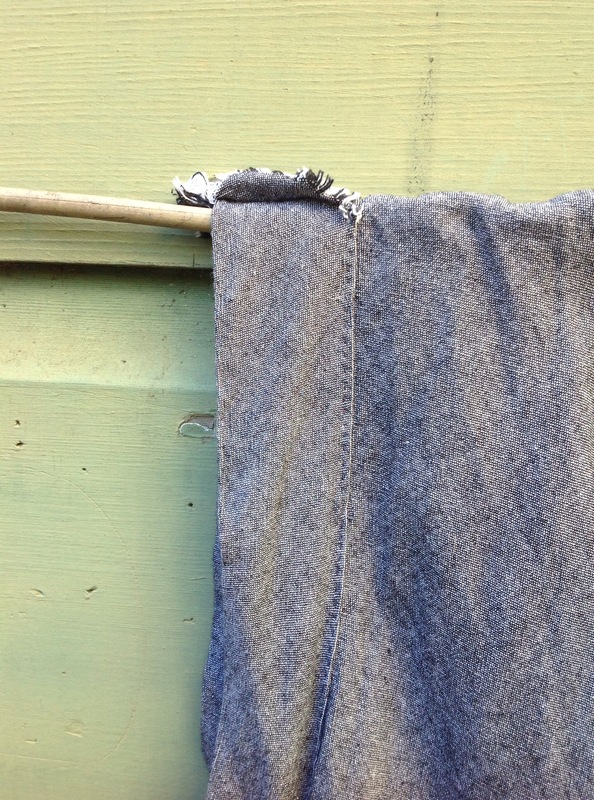 Hemmed pieces of fabric are perfect for so many things. 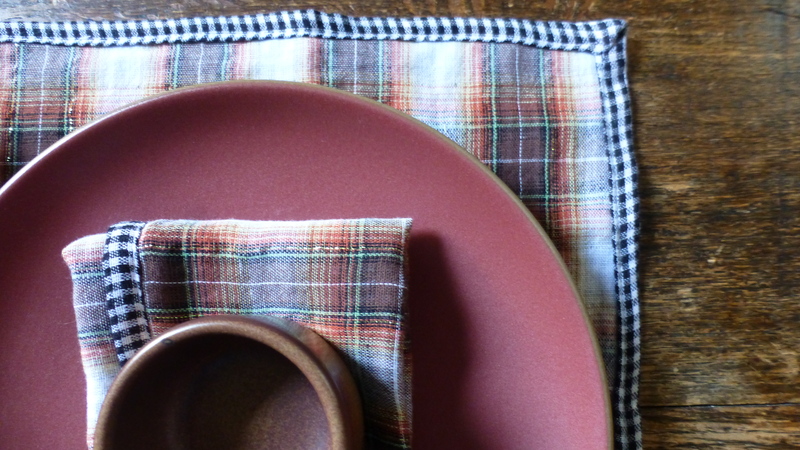 Tiny placemats, napkins, tiny tea towels, hand towels, or just something pretty to line a basket or bowl for fresh bread or fruit. 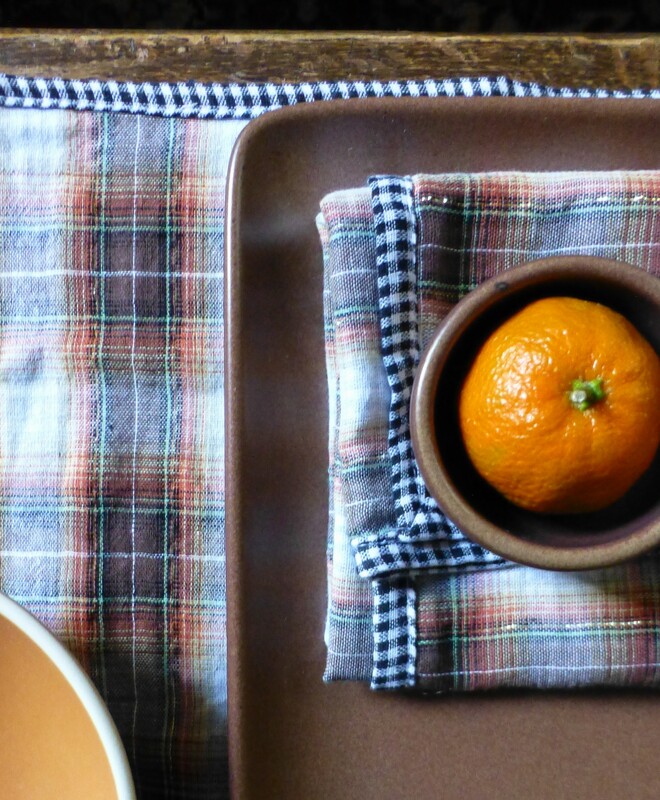 These are reversible napkins, cheerful and bright. 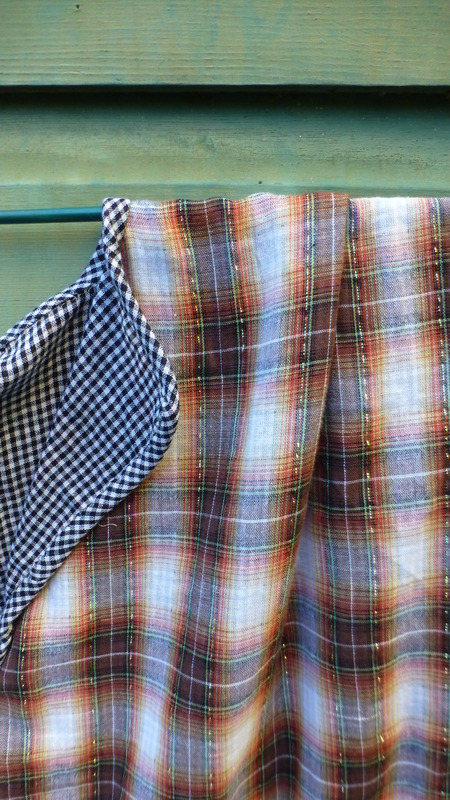 The brown and white plaid fabric has strips of glitter throughout. It is delightful when the glitter pops out. 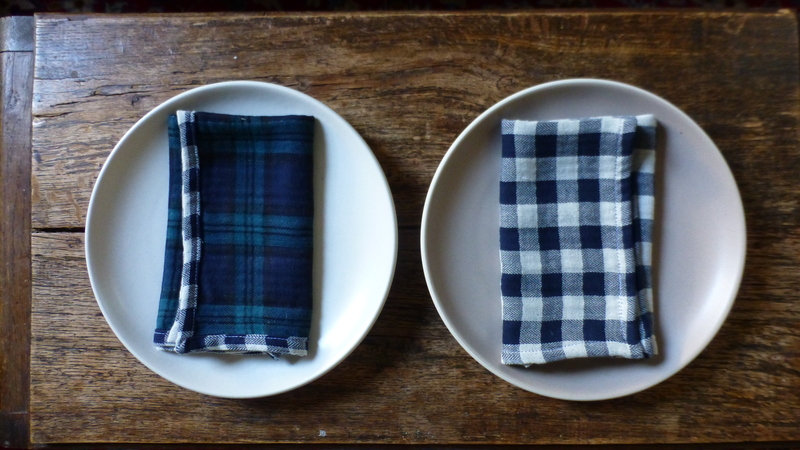 The napkins are on the smaller side, perfect for lunch with small plates and bowls. This tunic shape is one of my new favorites. I ended up creating a mini series to study the shape, and how it changed with different fabrics, combinations, and directions. These are the results. The above two are opposites. 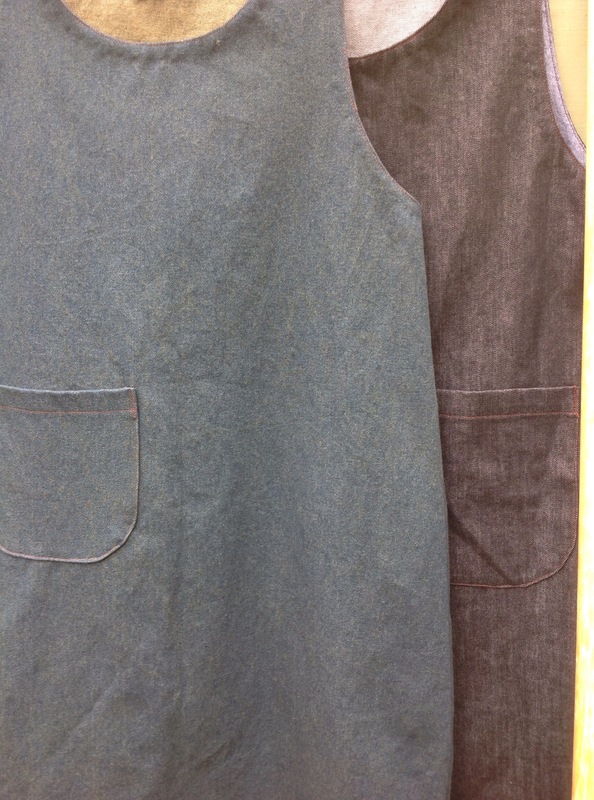 The fabric is the same, reversible double layer cotton, but the tunics were made with different right sides. 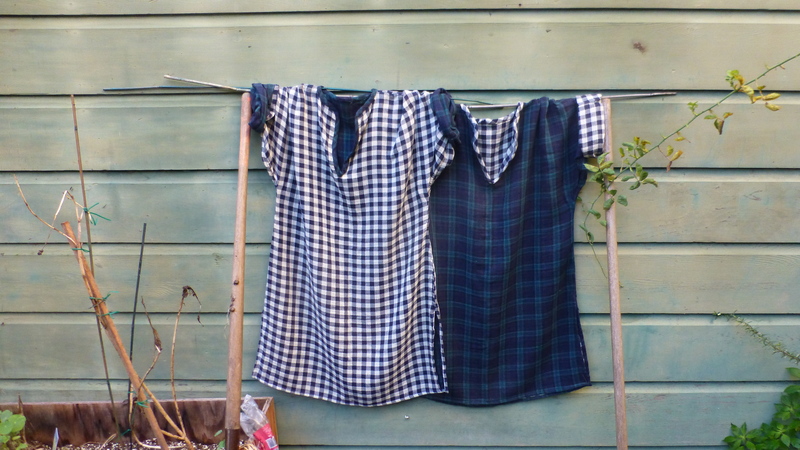 On the left, with the checks as the right side, and on the right with the plaid. It was fun for me to see how the different materials looked, fit, and felt. Some people look better in small prints, and some better in large prints. It is interesting to see the same shape, with different prints, colors, etc, tried on different people. They are both mostly reversible, although the inside seams aren’t quite as nice as the outside ones. 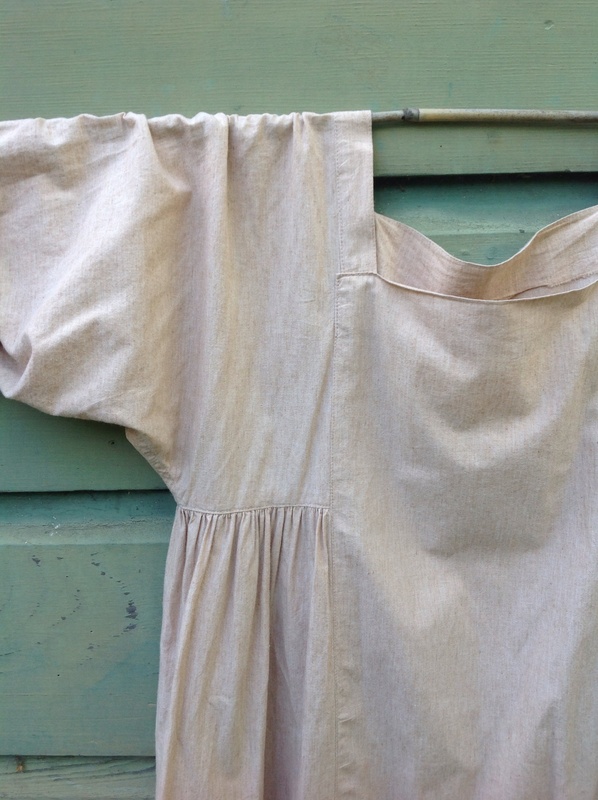 Above is the desert tunic. 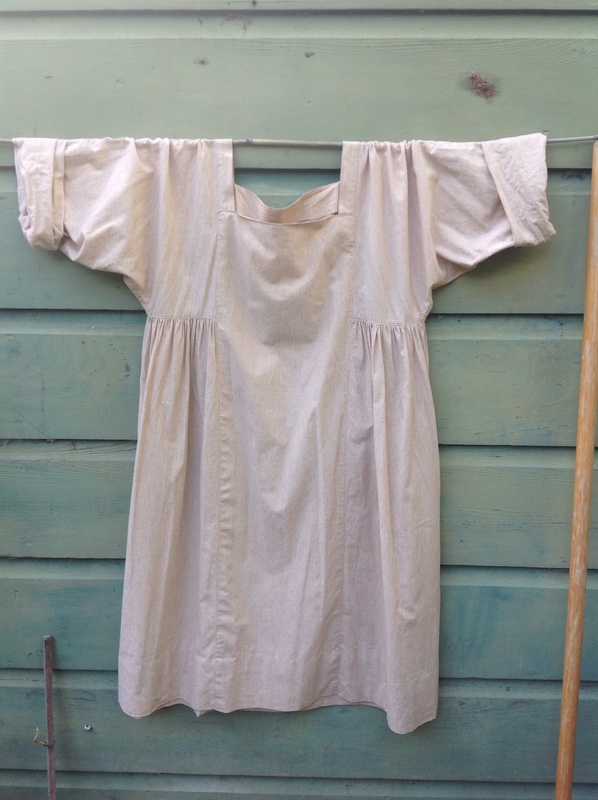 To be worn in a dry, sunny climate. The sleeves can be unrolled for more sun protection. It is the thinnest fabric of the bunch, and while double layer, it is the same on both sides. The sparkle plaid is one of my favorites. The little bit of glitter goes so well with the black and white check on the reverse! Again, it is two layers of thin fabric, magically attached together. It is a delightful combination, that still cheers me, even after working with it quite a bit. 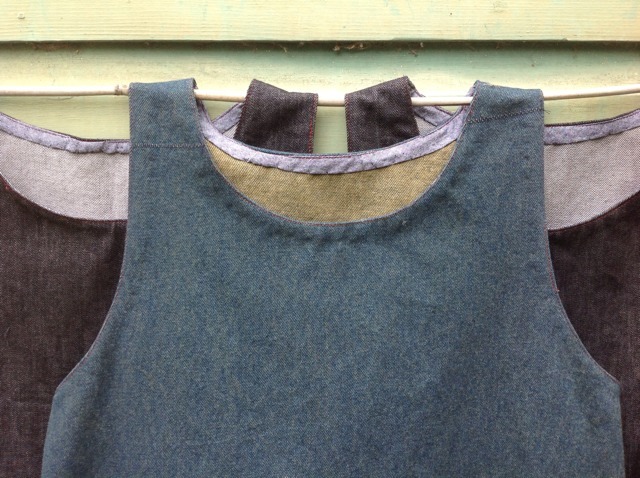 Each tunic s hand finished around the neck, with homemade bias tape. Every one is finished a little bit differently, to keep me entertained. All of these tunics are available for sale in my etsy shop here. 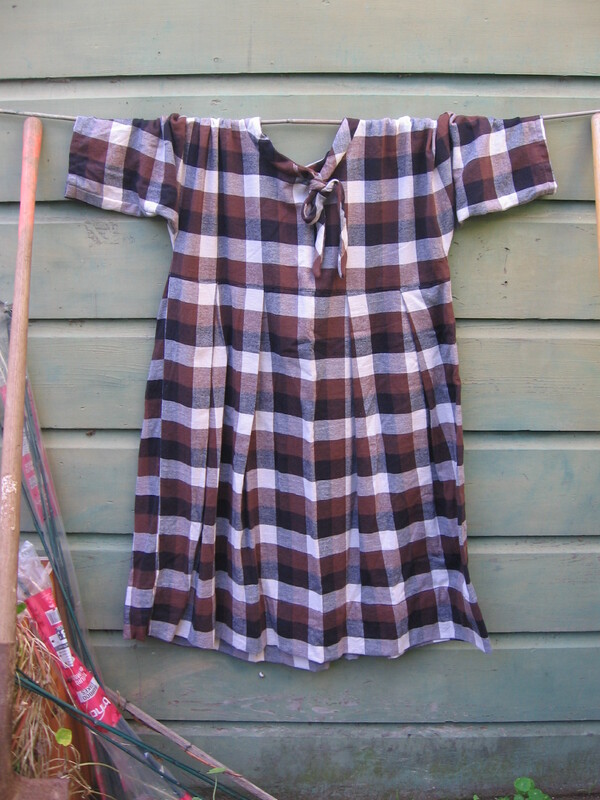 Here are a few new dresses, made of flannel, and made for winter. 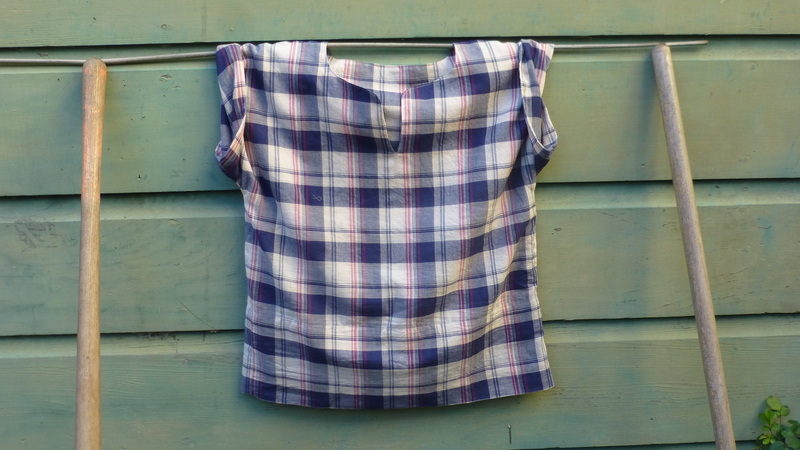 They are both designed similarly, with bias cut sleeves, box pleats, and a simple drape. 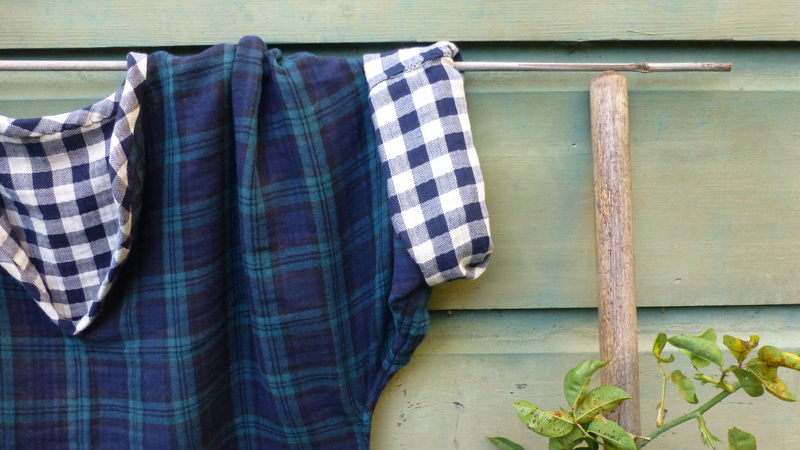 Blue plaid might work over tights or leggings, to keep warm in this cold, damp weather. 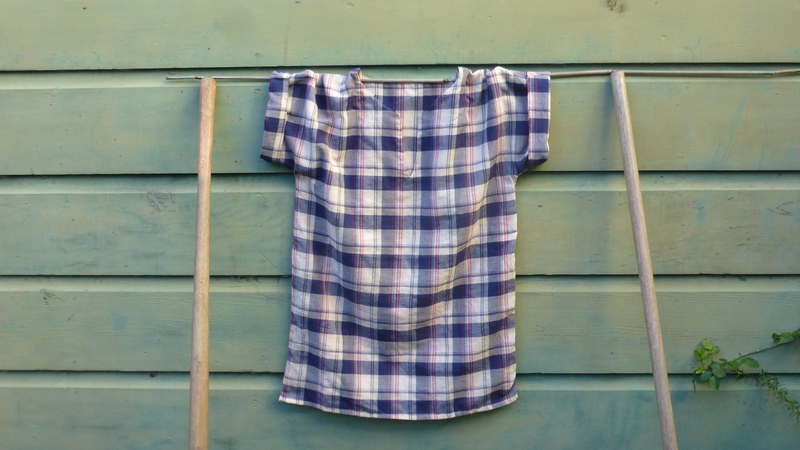 Blue plaid’s sleeves are not too long, and the boxy shape would fit well over a long-sleeved shirt. 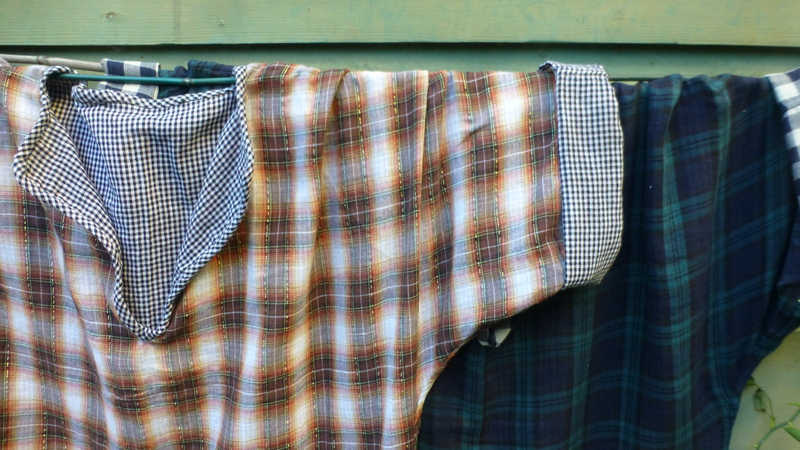 Blue plaid was designed to layer, and to keep cozy. 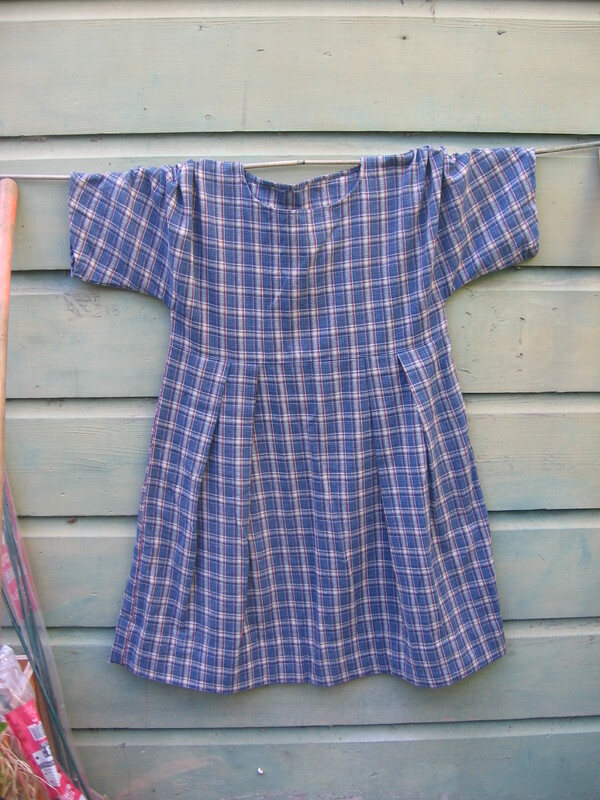 Blue plaid is available for sale on my etsy store. 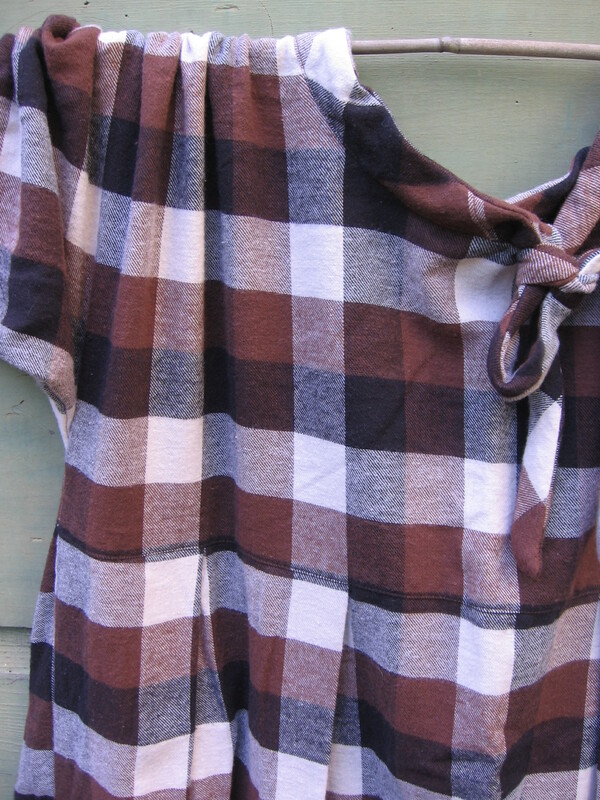 Brown plaid is going to my mom, so that she can stay warm while keeping shop in Iowa. With the cold winter winds, a warm dress is always welcome! 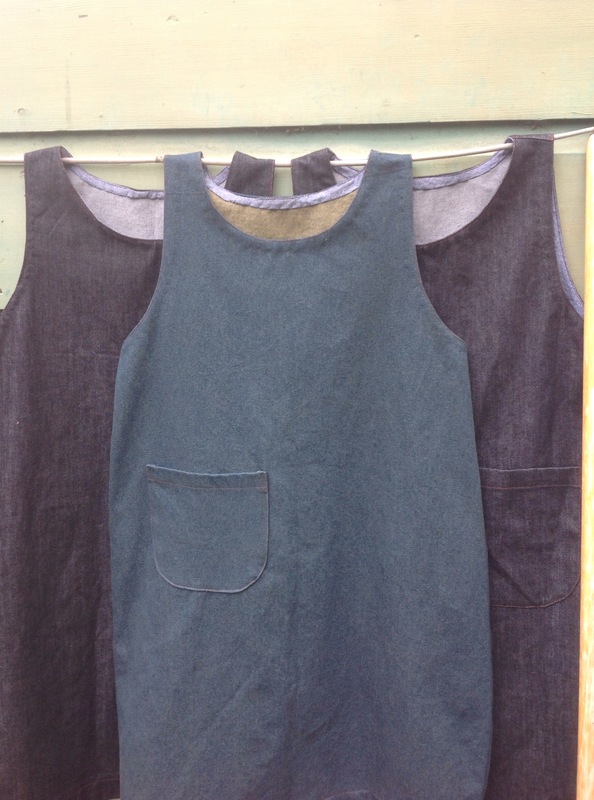 These are denim work dresses. They have a pocket for things; a tape measure or a trowel, a paintbrush, the corner of a tea towel, or perhaps a chisel. They are sturdy, and finished by hand. 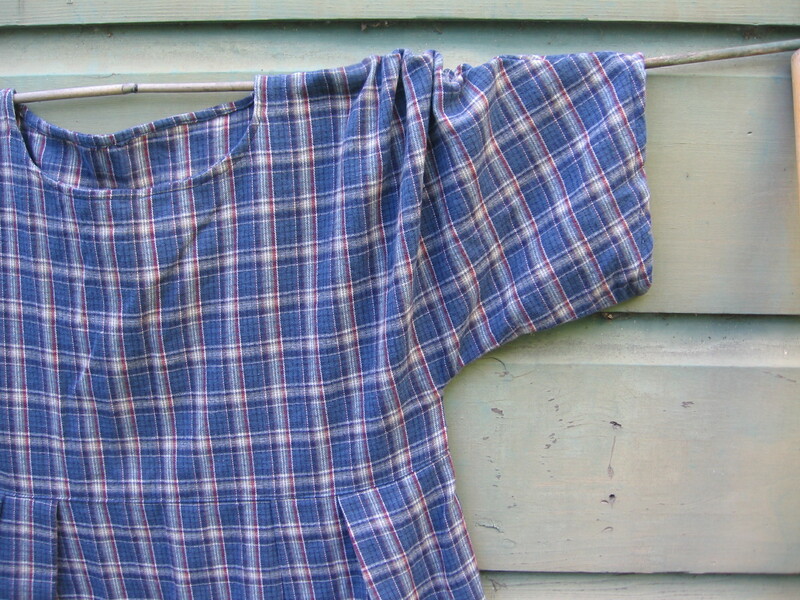 They are meant to be worn and used, patched, and used again. Some jumpers have right handed pockets, and some have left handed pockets. They are made for different people to enjoy. 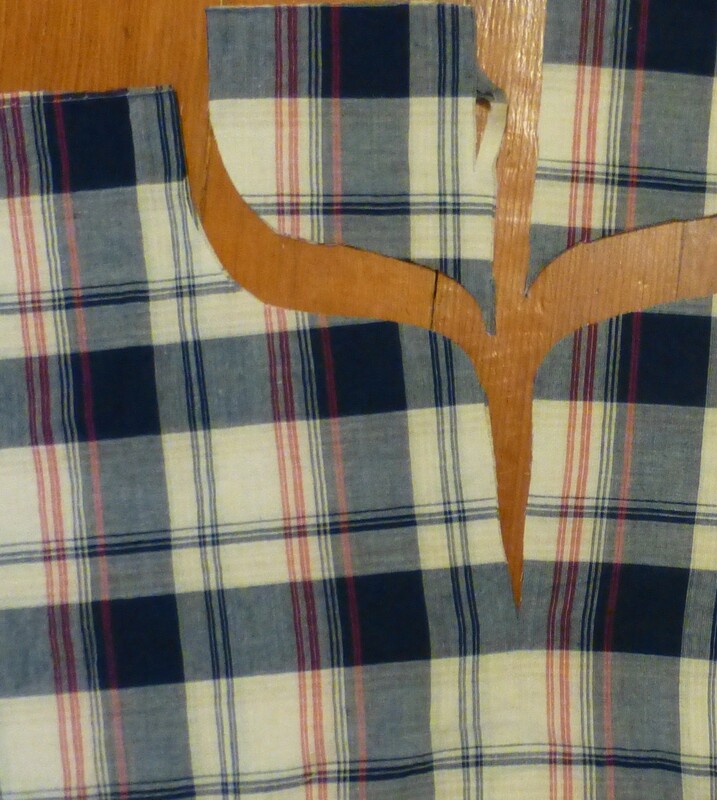 One of the pieces of fabric came with a flaw on the edge. 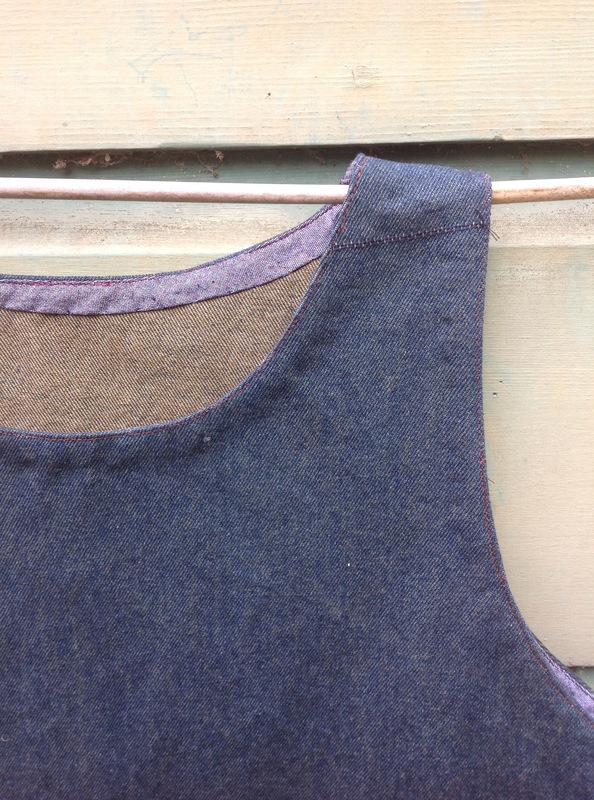 I put it right on the front, and wove a bit of thread in to make it look a little bit interesting. I like things with a little bit of character some of the time. There are three of these. One is spoken for, and the other two are up for sale. contact me if you are interested. 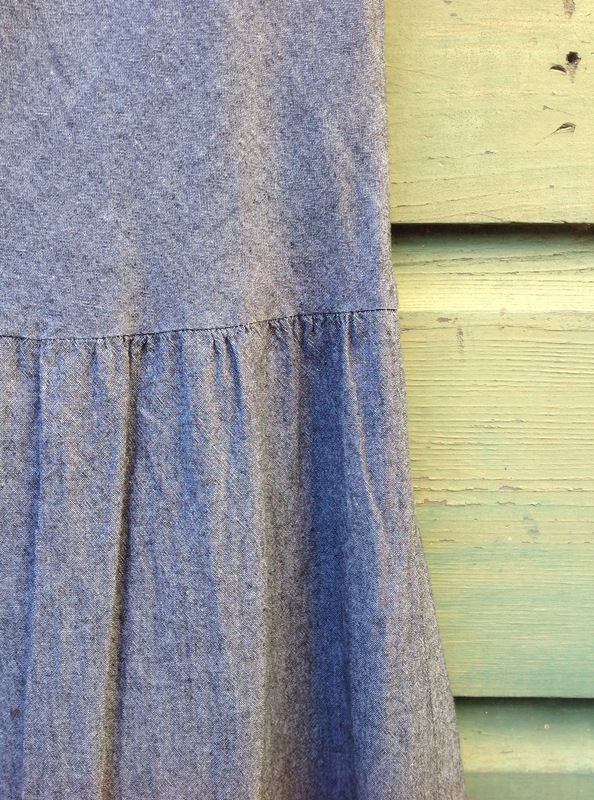 This dress is made with a combination of bias cut fabric on the top, and ‘regular’ fabric on the bottom. 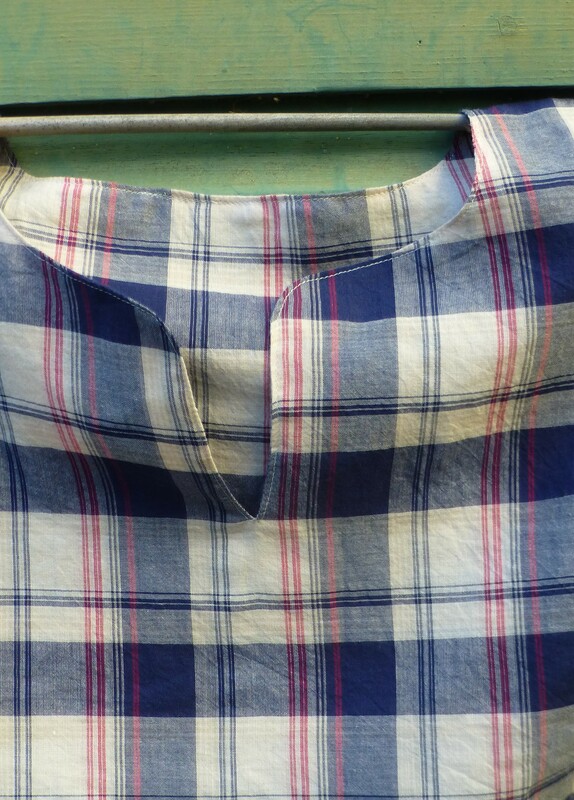 I wanted to allow for more movement in the top (which is created by the bias fabrics). The hand stitched detail on the sleeves was inspired by my work mending victorian lace. 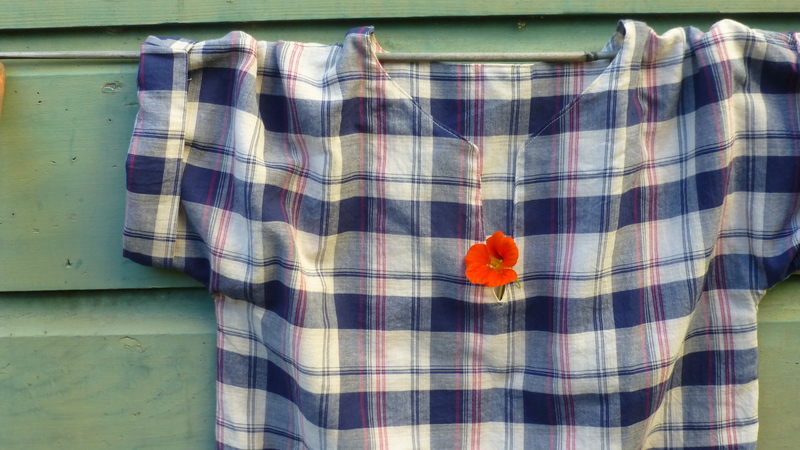 It seemed important to have something a little bit delicately hand stitched. Of course I left a messy edge to come undone and fray. 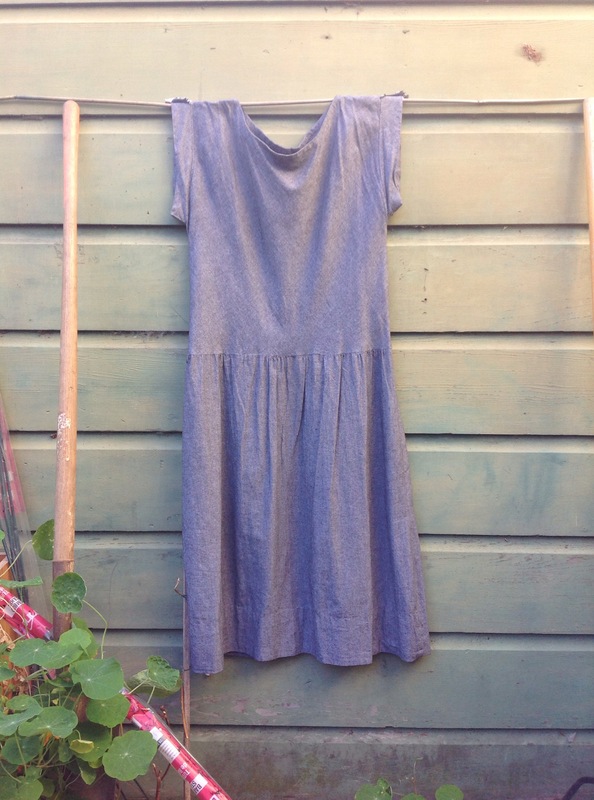 This dress is another one that is loose and comfortable. Perfect for moving around, doing things.